Scott Quintana is our guest this week and he has been touring the globe with the country singer and songwriter Kacey Musgraves. Marcos returned home from Miami (eventually) and subbed for Damon with the Atomic Funk Project at the Brooklyn Bowl. He just recorded at Congahead studios for Jeremy Bosch’s new video (coming soon). You can see the band at Rockwood Music Hall, Stage 2, on Sat Feb 8th at Midnight (no cover). Happy Birthday shoutout to Latin Percussion founder, Martin Cohen! Photo from the recording session for “In The Heights” movie that Marcos was involved in……..
Damon will be doing a percussion library for the Loop Loft at some point in the future. Damon’s first stop in L.A. was a Jamm Jam hosted by Elmo Lovano, founder of the JammCard App for musicians. Shoutout to Kaz Rodriguez for being the featured artist and we mention he has the auditory phenomenon called, synesthesia. The drumset Damon refers to that was made from the wood of the Stradivarian forrest can be seen below. Here is the video of the search for the wood used in the drumset pictured above. The images below are the almond wood, turned to plys, turned into the new style of drumset by DW. Sennheiser has some new wireless earbuds if you would like to replace your Apple airpods with something a bit more sophisticated. Damon’s team was the Champion team of the DW/LP/Gretcsh family bowling night. Photo evidence below! A couple of the companies making drum shells (not just the snares) out of metal are companies like Schagerl Drums or A&F drums. Shoutout to drummer Bernie Dresel in the background of the last photo. The world’s most expensive drumset is made by Musa drums by hand, from old balsamic vinegar barrels. The favorite preamp of drummers (because it had 8 channels to mic all the drums), the presonus fire studio has been discontinued. HOWEVER, they have the new Studio 1824c preamp that still has 8 channels. 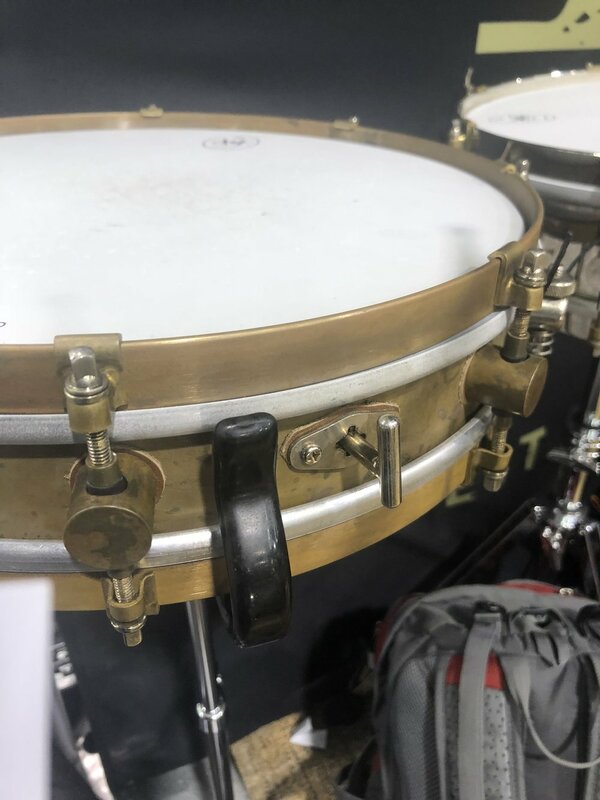 The tone ally is great to help you practice getting a straight path with your sticks…..
Shoutout to Pete Lockett for telling Damon about the A Frame. Roland came out with the new TM-1 trigger module. You can preview it in the video below…..
You can see the new congas we talked about from LP by clicking this page HERE. These are the CAJONS mentioned from the new cedar to the MT box to the Pedro Martinez and more (including the three zone box kit)! 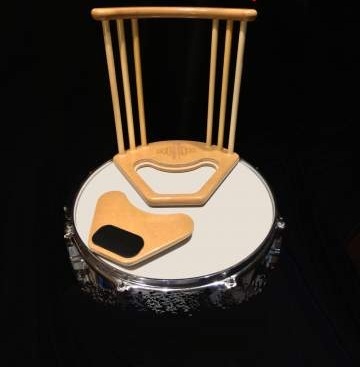 The awesome bongo throne attachment is no joke! You can peruse the rest of the new products and more by visiting the Latin Percussion WEBSITE. Lastly, Taku Hirano came out with his signature stick the Katana. Our educational spotlight this week is two things of note. Delton Davis of Kids Drumming has come out with an educational book (the first of more to come). Also, Play Drums has a be a roadie for a day contest where you can be around Cindy Blackman-Santana (and by default Paoli Mejias and Karl Perazzo). All the revenue streams you should know about and collecting money from (by friend of the show Chris Robley). Leaving Neverland’ Exposé Leaves Audiences ‘Shellshocked’ and Michael Jackson Family ‘Furious. After the Fyre Fest documentaries on both Hulu and Netflix, models, influencers, agencies and even a press secretary may be receiving subpoenas. You can mute R. Kelly and other artists with a new Spotify feature. You can tidy up your life with Marie Kondo. The song leading into the interview is “High Horse” by Kacey Musgraves. One of the first places Scott got to start his music career was the Children’s Music Academy. Then he attended high school and got the bug for Drum Corps. He first marched Pacific Crest before heading to Colorado and marching the Blue Knights. After marching the Blue Knights he went east and marched in the Cadets drumline. After marching and teaching drum corps, Scott went back to California and attended the Musician’s Institute and ended up transferring to Berklee College of Music. Scott talks about Casey Scheuerell as being a good mentor to him. After Berklee, Scott auditioned for Royal Caribbean cruise lines and ended up heading to the Mediterranean. After that contract, he moved to Austin, TX. Scott really enjoyed the Christmas album with Kacey for some of the different instruments he gets to play. One of the cooler things in Scott’s stickbag is a pair of the Vic Firth Dreadlocks. Scott uses Vic Firth Sticks and Mallets, Istanbul Cymbals (especially the 20” Om Crash), Q Drums, Evans Drumheads, Porter and Davies drum thrones, JH Audio in ear monitors and Gibraltar hardware. You can reach out to Scott on his Website, Twitter or Instagram. You can also catch Scott on tour with Kacey Musgraves. The song leading out of the interview is “Slow Burn” by Kacey Musgraves.